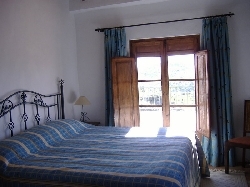 Casa Amber is a homely spacious villa built in Andalucian style, with wooden shutters and beams throughout. 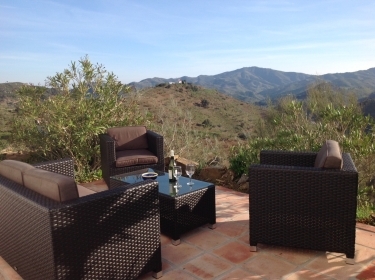 Located in a tranquil setting with stunning views across olive groves and neighbouring farmland to the mountains and hilltop white village of Comares. Several tracks run near the property which are excellent for walking and exploring the countryside and more than likely meeting a herd of goats. As well as a cosy lounge with tv/dvd and open fire, there is a dining room with refectory table and benches, sofa and patio doors leading to the private pool and sun and shaded terrace areas. You can enjoy the views while preparing outside dining at the brick built barbecue. The large farmhouse kitchen leads to a breakfast room with sofa and dual aspect views. Free wifi access is available. 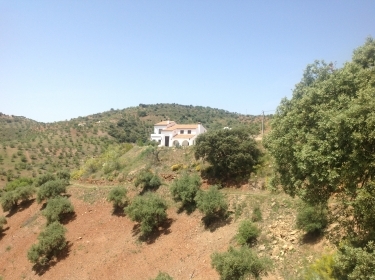 Upstairs there are 3 bedrooms, a double and twin and the master bedroom with kingsize bed and ensuite bathroom and patio doors leading to a small terrace where you can sit and watch the sun rise over Comares. There are 2 further bathrooms each with bath and shower. 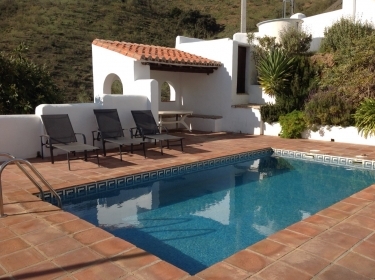 Casa Amber is located on a short track, 10 minutes outside the pueblo of Colmenar, close to Montes de Malaga national park and only 40 minutes from Malaga airport. Colmenar and neighbouring villages have banks, small supermarkets, bars/restaurants. Lake Vinuela with its lovely lakeside restaurants is a short drive away and Antequera and Granada and the coast are easy day trips.